A sheepdog missing since the weekend was rescued after getting stuck on a 50ft (15m) ledge during a storm. Alfie got lost on craggy ground near Tynron in Dumfries and Galloway and repeated searches by his owners failed to find him. 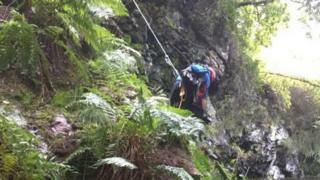 However, they heard him barking in an overnight thunderstorm on Tuesday and called out Moffat Mountain Rescue Team. They started a search of the area and Alfie was eventually rescued from the ledge where he had become trapped. The mountain rescue team lowered a team member to the location and collected the dog and brought him to the ground to be reunited with his owners. Shaun Duignan, team leader of MMRT, said: "Although this was an unusual callout to rescue a dog, the team were delighted to find Alfie none the worse for his ordeal and reunited with his owners."